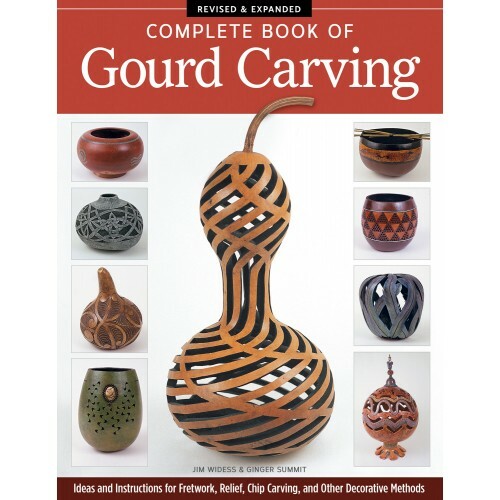 This authoritative guide covers every method and style of gourd carving with contributions by 92 international gourd artists and more than 625 gorgeous color photographs. Fretwork engraving chip carving gouge work relief carving inlay and sculptural carving are all thoroughly examined. A newly expanded gallery section the largest ever published will inspire gourd artists everywhere. Color photographs of exquisitely carved gourds present crafts styles from countries around the world. Step-by-step projects introduce new tools and techniques in progressive order of difficulty. Detailed instructions are provided for working with both hand tools and powered rotary carvers. Filled with new patterns and photos creative ideas and remarkable examples Complete Book of Gourd Carving Revised and Expanded is an essential reference for both crafters and art collectors.